Welcome to August 2018 in the world of MMA. 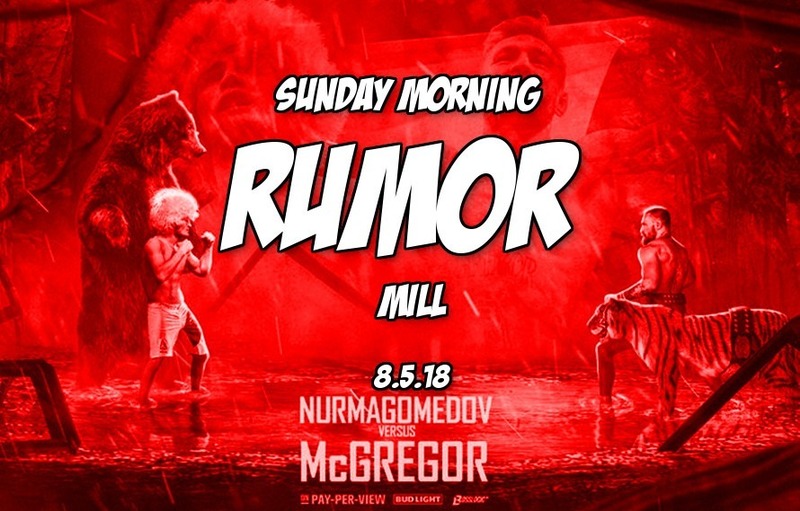 We’re eight months into the year and the final four months of 2018 may break the Sunday Morning Rumor Mill in half. Stuck in an UFC 227 hangover, we still may not be over our Conor McGregor vs. Khabib Nurmagomedov haze. Everyone thought the shadow of the UFC 229 main event announcement would crush poor UFC 227. It almost did until Cejudo pulled a Cejudo and Dillashaw went full Killashaw. (dolla dolla Billashaw). Huge if true but it looks like Conor vs. Khabib was booked last month and both fighters have already began training for the match-up. As of now no media world tour will accompany the fight. Rumor is Team McGregor wanted this camp to feature less media obligations than prior UFC fights. Still looking to add big money fights to UFC 230 at MSG, the promotion is thinking outside of the box with their main event ideas. Possible solutions for the UFC 230 main event include a GSP Anderson Silva catch-weight fight. An introduction a new weight class title is on the table. Also a quick turnaround for Daniel Cormier could make sense. In the aftermath of UFC 227, rumor is the UFC is seriously considering letting Henry Cejudo move up in weight to challenge TJ Dillashaw. Mighty Mouse being out an extended period time with an injury may help the case for this super-fight. Rumor is Brock Lesnar is looking to sign nothing but short term deals with the UFC and WWE. Lesnar likes the idea of hitting the free agent market a few more times. Lesnar wants to flexible for the remainder of his in-ring/cage career. Former UFC welterweight turned pro wrestling star Matt Riddle is rumored to have signed a three year contract with the WWE.